GARY LANGLEY/BLIND DOG PHOTO ASSOC. The “River House,’’ as the writer calls it, overlooks a natural waterway and incorporated water in its design. The owners won’t let me say their name or where the house is located. They’re afraid of being invaded by architectural groupies. I’d heard about the house over the years. But it’s only recently, because they have sold it and are packing up to leave, that I’ve had the opportunity to make a couple of visits. I’ll call it River House for lack of another name. It stands on high ground west of Boston, overlooking a wide bend in a rural stream. I would say it’s one of the 20 or so best houses, of any period, that I’ve seen in the Boston area. 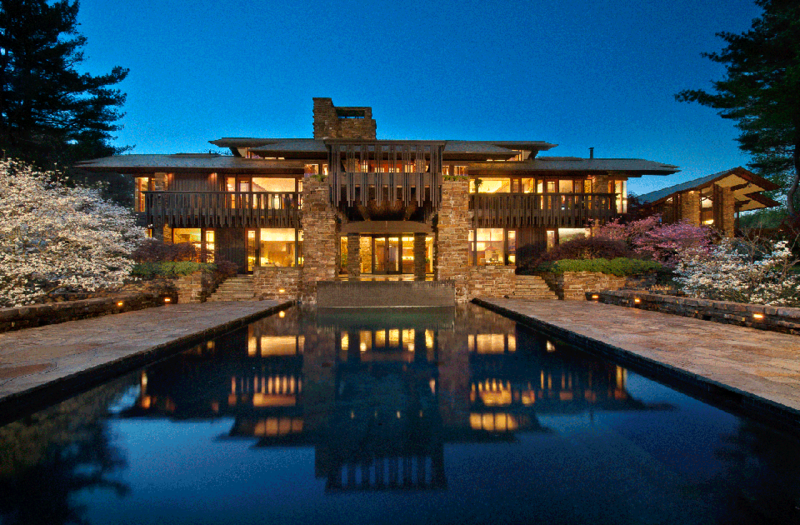 The designer was one of the major American architects of the 20th century: Fay Jones of Arkansas. Jones did nearly all of his work in his home state. He accepted the River House job only after a lot of persuasion by the owners, who are a married couple originally from Arkansas. Jones (1921-2004) is best known for an exquisite woodland retreat called Thorncrown Chapel, near Eureka Springs, Ark. What’s so remarkable about River House? Pictures tell the story better than words. I’ll just cite three qualities: the way the house embraces the land; the loving craftsmanship of the details; and the bold use of natural materials, especially stone. Take the stone. It’s in walls, chimneys, fireplaces, and supporting piers. It’s cut into crude shapes with rough surfaces and made to look as if it’s been piled up loosely. Most dramatic are several huge boulders that serve as lintels to span the fireplace openings. They must weigh several tons each. You wouldn’t think anyone would bring rocks to New England, but the fireplace boulders came from Arkansas. The owners and their architect toured an Arkansas site beloved by Jones, a place filled with stone left by glaciers eons ago. They chose shapes they found interesting. These boulders were then shipped north and lowered by cranes through holes in the River House roof. That’s a lot of industrial sweat to achieve a natural look. In a way, the great stones, ripped from their context, have become theater props. But it’s masterful theater. As for the woodwork, it’s as delicate and craftsmanlike as the stonework is rough. Wood and stone come together like a baby’s cheek and a dog’s muzzle. Most of the wood, even on the floors, is warm-toned cherry. Jones custom-designed everything, from the dining and pool tables down to tiny vents and light fixtures. One move you don’t notice at first is the inventive use of mirrors. They’re tucked inconspicuously into corners and ceilings. They expand the space or mislead your perception of it, or both. There’s also a mysterious graphic motif, a kind of signature of the architect. Appearing on doors and chairs and many other places, it’s a diagram of nine vertical stripes. It reminded me of the harmonies of a Fibonacci series in math or a golden ratio in geometry. A sketch of the motif appears on the inside covers of a book on Jones’s work. The site planning is simple and eloquent. River House is strung out from east to west along a ridge. It’s like a parade rank of rooms, with sunshade roofs like visors, standing at attention and facing the river. At certain times and seasons, the early morning sun shines directly through the full length of the house, uninterrupted by doors, from a family room at the east end to the master bedroom at the west. Along with the wood, the rock, and the alignment toward the river, that presence of the sun is one of the ways in which the house feels locked into its surroundings. Are there weaknesses? One of the owners thinks hard and says it’s sometimes difficult to find light switches. For myself, I would only note the multiplicity of gable roofs, which from some angles look like a convention of dark vultures about to take flight. As with any art, part of the fun of architecture is playing the game of spotting predecessors. Architecture buffs will have no trouble identifying, in the photos, the powerful influence of the great Frank Lloyd Wright. Jones knew Wright and admired him. But, as has often been said, he was the only one of Wright’s many followers who achieved much independently. Other acolytes were overwhelmed by the great man’s talent and became his imitators. Fay Jones mastered that influence to forge an architecture of his own.